Just Keep Sweating: FitBlog NYC Recap! 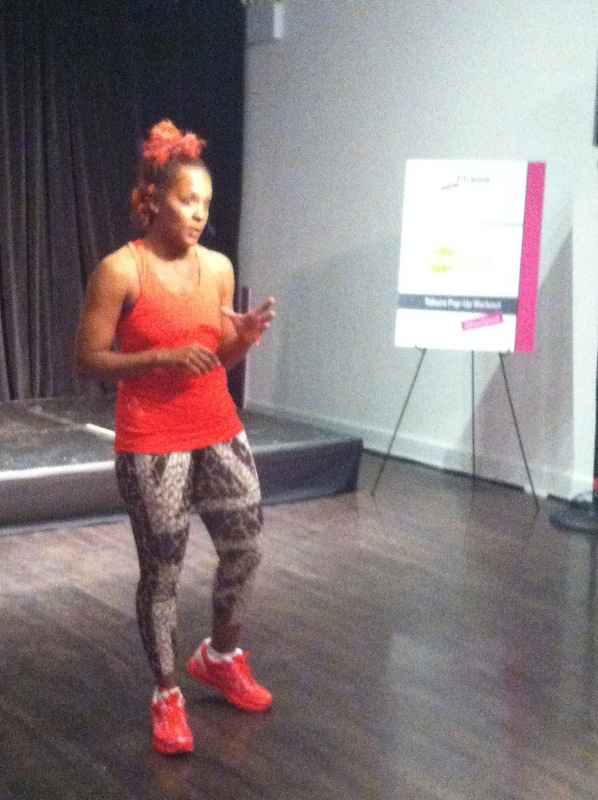 How do I even begin to recap a whirlwind of a day that was FitBlogNYC? I had NO idea what to expect yet it exceeded all of my expectations. I met up with a few girls in Penn Station so none of us would have to walk alone, and it was a good thing we did because we may have missed the venue if we didn't! Upon arrival we were given bags and badges, I honestly was SO overwhelmed by the stations-the people-the entire event I didn't take nearly as many pictures as I had originally wanted to. 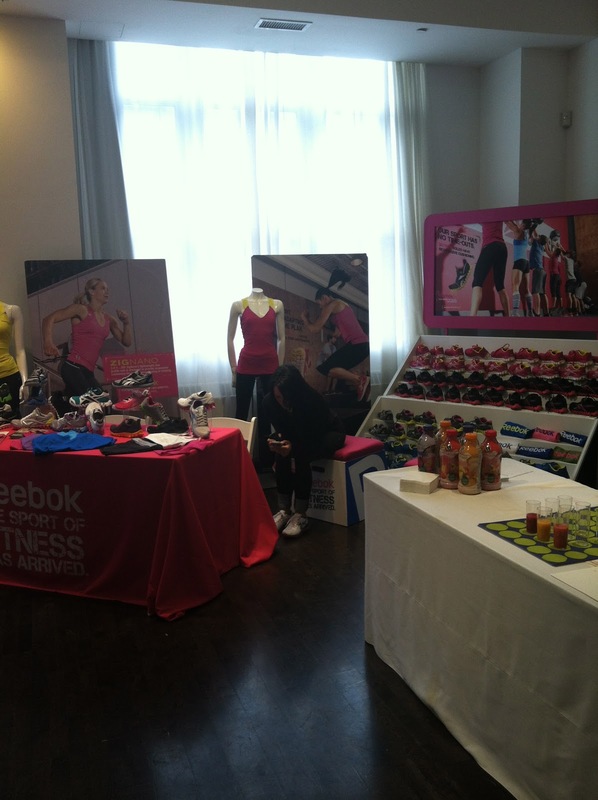 The first booth I saw was Reebok, all of the bright colors were so appealing! We tried on sneakers and got free socks! Then it was time for OAKLEY! I had no idea that I was trying on sunglasses that I would actually be picking out to take home! Another pleasant surprise was the Birkenstock booth. The women working there really took their time with each of us to make sure we got the perfect size and fit for our new sandals! I got bronze which I think will go great with most of my summer clothes! One of the TWO Camelbak water bottles I received. I do not know how I lived without one of these for so long! -How to turn your blog into a business featuring Kelly Olexa(goddess) Carla Birnberg of Miz Fit Online, Julie of PBFingers and Tina of Carrots N Cake. 2. BRING YOUR DSLR if you want. I wish I did and now I will never leave home without it. Reign, the creator of Tabura fitness...check out those awesome pants! 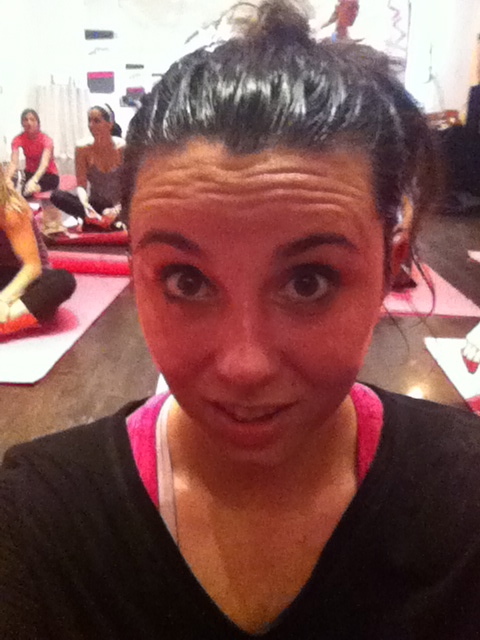 After hearing all of the amazing panelists it was time to SWEAT! 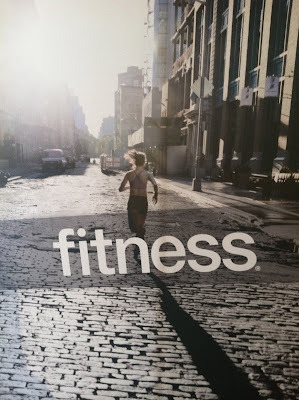 Kiwi Fitness, which is a pop up fitness company was there and they introduced all of us to Tabura. African dancing mixed with kickboxing. We were kicking, mountain climbing, dancing for 45 minutes straight and I was drenched by the end. Can you tell I was in shock? Honestly I am still trying to process the entire day. I met so many amazing bloggers, ones that I have been reading for years and some newer ones. I didn't get a chance to meet everyone I wanted to, mostly my own fault, BUT I know there will be other opportunities to in the future! Thank you to Fitness Magazine,Kelly Olexa, FitFluential, Oakley, Reebok, Birkenstock, Camelbak and Kiwi Sweat (and so many more)for a truly AMAZING day and experience! Yesss best day EVER. I'm also still processing, so much so that the thought of recapping is overwhelming. Way to get on it! Can't wait til we hang out again :) If we're in for the launch, be my date next week? Nice meeting you! It was a great wvent! Rock star... thanks for the recap. Now we need a men's and women's version of something like this for running. 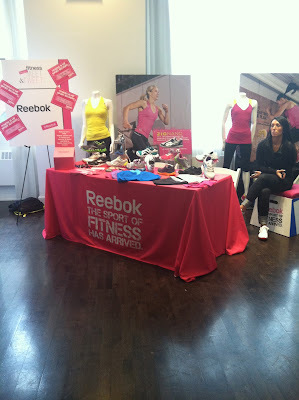 It was so great meeting you and the other ladies at FitBlogNYC! What an amazing experience, I still can't get over all of the swag! I ended up exchanging my shoes last night for the bigger size and got the pink ones like yours, wahoo! :) Hope we can get together soon! I'm thinking we should try out one of Physique 57s classes!